The rhums of Chantal Comte have been of consistently high quality throughout my relatively brief acquaintanceship with her brand. Mme Comte, you may recall, is an independent bottler with the twin advantages of having a long association with spirits (she is the owner of a wine making chateau in France) as well as a boatload of familial connections and wasta in Martinique. The La Tour L’Or HSE, the 1980 Trois Rivieres and the 1977 Trois Rivieres rhums were all products that impressed, and I had thought so even when my experience with agricoles was more limited. There was something about the richness and subtlety of the final products she issued that simply could not be ignored and many of them were under ten years old, which was and remains its own endorsement. After the positive experience of the 1977 Trois Rivieres and the purring incandescence of its cousin the 1980, one wonders whether such a run of great agricole bottlings can be sustained, time and again, each new generation topping the previous one. In short, not really – these are variable rhums, pricey rhums, not always easy to get: and the 2001 Reserve Speciale, while no slouch by any means, didn’t quite ascend to the heights as some others did. That’s not to say this is a bad rhum, or even a merely-average one. Oh no. It’s quite a delectable drink. Consider first the nose which started off relatively easy, as befitting its 45.5% strength, providing aromas of faint rubber and acetone, green apples and pears and florals. It didn’t stop there either, with a sort of creamy, nutty cheese, plums and apricots, a flirt of oak and vanilla and nougat adding to the panoply. It occurred to me that this was hardly a standard profile for an agricole at all, what with the lack of clear, herbal, grassy, sugarcane sap smells – but you weren’t going to hear me complaining too loudly, because what slowly billowed from the glass was quiet and pleasant in its own way. The palate of the golden coloured juice from La Favorite sort of broke up the melange by pivoting to tastes that were more precise and distinct. It was warm, medium bodied, and quite firm. One could sense peaches, more plums and fresh-cut apples, cider, plus sea salt and white pepper and ginger cookies. After resting and with just a smidgen of water, there was more: lemon zest, florals, vanilla for the most part, and I have to admit, I liked it a lot — it presented as warm and musky and earthy and clean, all at once, in a sort of quietly enjoyable amalgam of flavours, not too many, but well and carefully assembled, so they don’t elbow each other all over the place. The finish was kinda short, and dry, but in this case that was okay, since it closed up the experience in a calm and easy fashion, without any spicy aggression that threatened to skewer nose or tonsils. It was, compared to a very good beginning, somewhat weak, and nothing new came to my attention aside from the earthy tones and light fruits and florals. This rhum was distilled in 2001 and bottled in 2008, making it seven years old and had an entirely respectable 3100 bottle outturn. It makes mention of being a ”Appellation Martinique Controlée” product but since this is not an AOC designation one can only wonder what that was all about or whether it was a misprint. I merely mention it because it seemed so odd. So, in fine, it was enticing, tasty, well rounded, without harsh notes of any kind, I liked it a lot and consider it a worthwhile addition to anyone’s agricole shelf. The title is also something I appreciated, even though it had nothing to do with the product itself. It translates into “Traveller’s Tree” and is a symbol of hospitality on Martinique — it provokes images of dusty travelers in lands far away, stopping to relax under its shade so as to rest weary feet and aching body, and partake of the water caught in the gently swaying fronds. And maybe have a shot of this rum. The romantic and storyteller in me likes the concept, because after a tough day at any endeavour, I could just see myself pouring a shot or two of this quietly delectable seven year old and shedding all cares. Maybe even under a tree. Rum Corner reviewed this rhum, much less positively. We both sampled the thing at the same time, at the famous 2016 ‘Caner Afterparty in Berlin, so this must come down to a difference in palate and final opinion. Cyril of DuRhum also tried and wrote about it…way back in 2013. Always ahead of the curve, that man. Another lovely Martinique agricole from Chantal Comte, lacking something in its construction to be truly great. Before I venture into fresh waters, the next few weeks will be about housekeeping – writing about rums to which I have referred elsewhere and which are now getting some attention of their own. Unsurprisingly, the first one is the older-but-not-quite-so-stellar brother to what may have been the best rum I tried in 2015 (the 1980 Chantal Comte), also from Trois Rivieres on Martinique, somewhat older (twenty years, versus seven), but with less power (45% ABV), more outturn…and less of a price tag. Note that just because the rhum is cheaper doesn’t make it a bad investment. 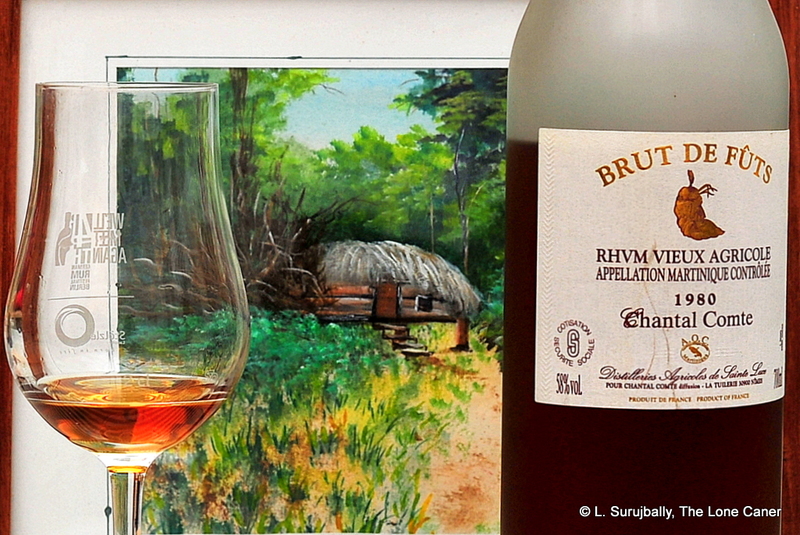 In its own way, the Chantal Comte Rhum Vieux Agricole 1977 is also a very good product (its misfortune was to be tried in parallel with a better one), and I would never tell you to steer clear of it, because it displays all the hallmarks of a potentially great agricole — well tended, lovingly aged, smartly selected and a sheer delight to drink. Plus it doesn’t have some ridiculous outturn of 100 bottles that makes people shrug and walk away – fifteen thousand bottles of this thing were issued, so there’s hope for us all. Anyway, let’s get straight into the sniffy matters. Quite some polish and salty wax wound about the opening scents of this mahogany rhum, and somewhat like the Neisson line of agricoles (to which we will be turning our attention later this year), they were relegated firmly to the background with out ever letting you forget they existed. Salt beef in brine, red olives, grass, tannins, wood and faint smoke were more readily discernible, mixed in with heavier herbs like fennel and rosemary. These well balanced aromas were tied together by duskier notes of burnt sugar and vanillas and as it stood and opened up, slow scents of cream cheese and marshmallows crept out to satisfy the child within. So not bad at all on the nose, a lot of differing profiles were duelling for attention, but nothing to complain about. Was the taste as good, or better? I thought so. The smooth mouthfeel and heated overall texture of the 1977 and the 1980 were almost exactly the same to me, though the tastes did diverge. A sort of passive-aggressive meaty paté on rye bread underlay other flavours of bitter black chocolate, coffee and almonds on the medium bodied 1977 in a way that had been much more dialled back in the 1980. It was a darker rhum, however, and maybe even a smidgen richer (just not better). With water we got more party favours: additional tastes of sugar coated butter cookies, those candied chocolate oranges, salted butter, eclairs, more cream cheese, some more definite leather and smoke, and a light floral background that elevated the whole experience. Finish was medium long, almost short, but warm and not spicy at all. The lack of strength made this easy going. The briny notes persisted, accompanied by almonds, oak a last bit of vanilla, sweet and deep – quite good, if not as exceptional after the excellence of the palate and nose. Clearing away the glasses, then. I didn’t think the 1977 was as good as the 1980, though it was still quite exceptional in its own way, as that score shows. Leaving aside the slightly faltering fade. it was the same salty and olive notes so well held in check by the 1980, that took on a slight dominance here: and that created a subtle imbalance in the profile, detracting from what was an otherwise excellent – even remarkable – rhum. However, this is a personal quibble – you would not be doing yourself a disservice to acquire the 1977 (not least because of the lower price point for an older product that is a very good one). And if you can, try the two in conjunction. Each informs the other and allows you to judge the strengths of one against the difference of the other – I’m almost convinced you would love them both given the chance. I know I did, and consider that the experience of sampling them together, in the company of the persons who were in the room that day, one of the best of my 2015 rum calendar. I’ve spoken about the company in both the 1980 and the Tour d’Or reviews, so I won’t go back into the details here. The presentation was good,with a shiny cardboard box enclosing the bottle as shown in the photo above. 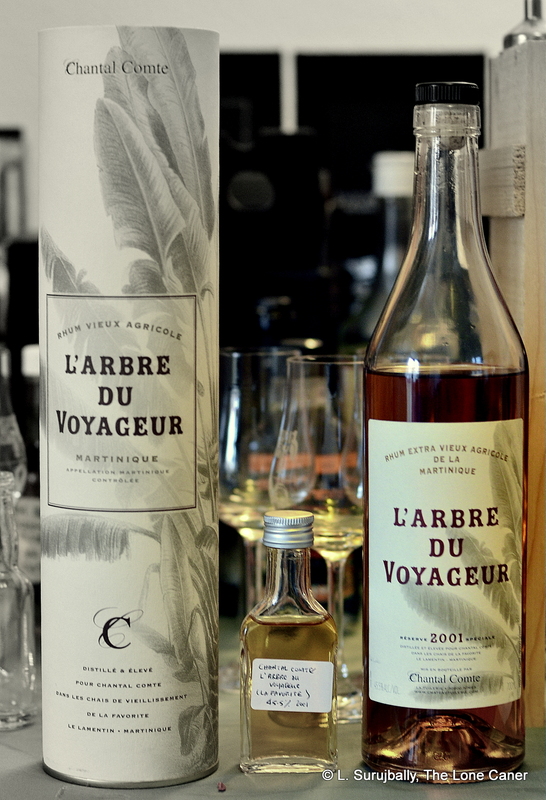 This rhum is a quietly dazzling masterpiece. The Chantal Comte 1980 purrs away in the glass, containing so many quietly thrumming riches, revealed in so gradual a fashion, that it embarasses ordinary rums. And yet, its characteristics aren’t gaudily thrown before us to entertain or impress. There are no marketing tricks here, no fancy “finished in…” or “made this unusual way…”. No dosing, adding or off-the-wall ageing. It is only after I tried it for the fourth time that I truly appreciated the full reach of its accomplishment, and realized how well and how subtly it had been made. And all this from a seven year old rum. 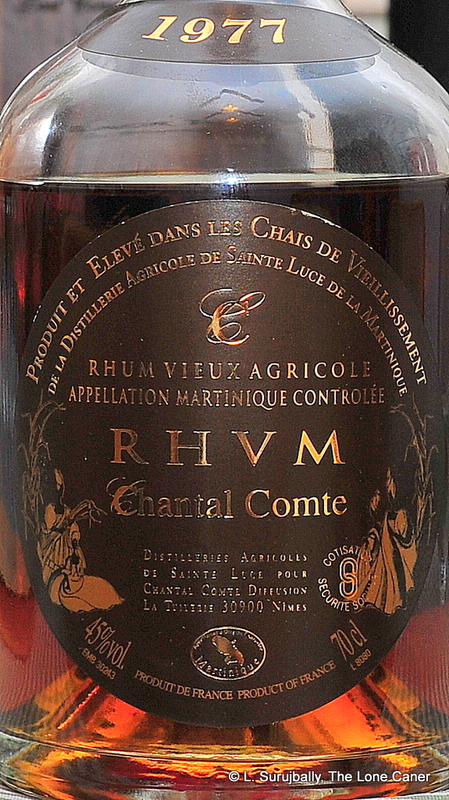 The Chantal Comte Rhum Vieux Agricole Appellation Martinique Controllee 1980 (to give it its full title) hails from St. Luce, which is to say Trois Rivieres. 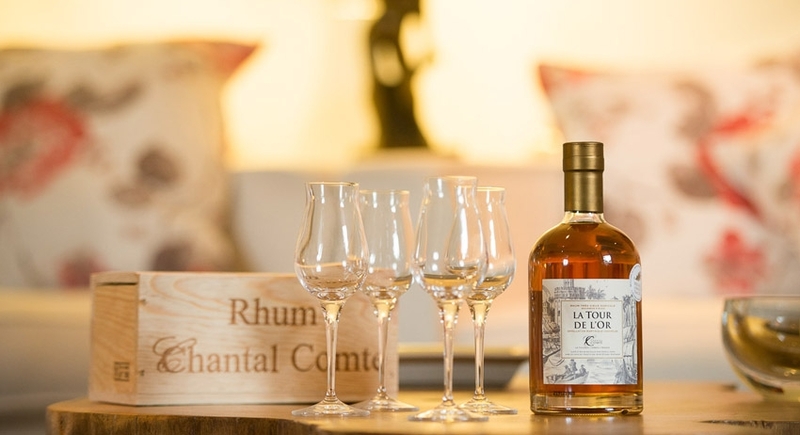 Chantal Comte, a lady who owns the Tullieres estate in France, and who also has a long association with the French West Indies, has an appreciation for rhum which many years ago prompted her to begin issuing aged agricoles under her own label. The Hors D’Age from Habitation Ste. Etienne was a wonderful rhum for example, and the 20 Year old St. Luce 1977 Millesime was also pretty good — yet here she does it one better, and perhaps this is one reason why the price of the seven year old 1980 is more than twice that of the 1977 even though less than half as old (that and the fact that 15,000 bottles of the 1977 were issued, versus 1400 of the 1980). The presentation was somewhat lacklustre for a rhum of this price: a black cardboard cylinder enclosing a very handsome frosted glass bottle. Never mind, I’ve made my sniffy observations on this kind of thing before. The label, relatively simple, filled in some of the details noted above. The age was not stated and it took some sleuthing around to have it confirmed that it’s a seven year old…no idea why that was omitted – were they waiting for a reviewer to talk about it, perhaps afraid people would be put off by its single-digit age? Anyway, forget the preamble and walk with me through the sampling. It was a dark amber rhum, issued at a solid 58%, and the nose…well, all I can say it was great. It was a beautifully rich yet simultaneously subtle, and complex to a fault. An initially warm and delicious melange of fruits, flowers and the faintest background of turpentine and well polished floors. This developed into lavender, toned-down lilies, unripe cherries, everything soft and yet edgy at the same time (that was the 58% speaking – it intensified everything without actually moving the rhum into harsh bitchiness). But this wasn’t the end. We were in the middle of a six hour tasting session and as the hours wore on we kept coming back to this one glass, and by the time it was over, to those flavours we smelled, were added some faint caramel and molasses, vanilla, cinnamon, very faint ginger and baking spices. And all these in a really harmonious balance. Since it was a relatively strong rhum, I expected some sharpness at the inception of the taste, and indeed this was there. But that dialled itself down to a strong kind of heat that made the experience a much better one after some minutes. It was quite full bodied and intense, and the immediate sensations were of butter cookies with a strawberry jam centre (for the benefit of my friends Henrik and Gregers who were there with me, I’ll say they were Danish); cinnamon again, black cherries teetering on the brink of over-ripeness, plus an assortment of light peaches, apricots, bananas and dark honey. And all this intertwined with the sweetness kept way back, a dusting of leather and smoke, aromatic port infused cigarillos, some drier woody notes, and even some brine…but I must emphasize how extraordinarily well this all came together, without any one aspect dominating any other – it was as well balanced and solid as the keystone in a Roman arch. As for the finish, well, what can I tell you? It was great, summing up everything that came before: long and a little dry, spicy and wholesome, with both the sweet and the salt of a top-end Japanese soya, finishing things off with some oaky notes, almonds, vanilla, and port. The construction and gradual unfolding of this thing is amazing. I started by liking it, an hour later I was impressed, and by the time the evening was over I was in love. It took time for the full effect to sink in. It lacks the rough hewn brutality and single-minded intensity of the Veliers, and is perhaps more akin to Rum Nation…just better (perhaps because “dosing” is not part of the assembly). The 1980 may be classed as an AOC agricole, but I honestly think this has aspects of both French and Spanish style rums (with maybe a flirt of Bajan thrown in for good measure). It’s an order of magnitude better than many products twice or three times as old, and thinking I was being too enthusiastic, I tried it four separate times over a week and yep, it was still as good as that first time. It is the best sub-ten year old rum I’ve ever tried. I truly enjoy rums that are well made and appealing, no matter who makes them, and find that certain companies are consistently top grade. That they are almost all independent bottlers not seeking to dominate their market (though Velier comes close) may be key to the quality of their rums, because they are niche players, not commercial mastodons like Diageo or Bacardi, and therefore they pay careful attention to what they slap their labels on. Their stuff isn’t made by committee, so to speak; perhaps to them money and market share is less important than making rums, not mere products. Yet, even within the small independent world of Veliers, Compagnie des Indies, Duncan Taylors, Rum Nations, Moon Imports and Samarolis, there are occasional bright shining stars that amaze and awe us with the sheer brilliance of their creations. While it’s obviously an unknown if all of Mme Comte’s rhums operate at the level of the three I have tried so far…I can hope. 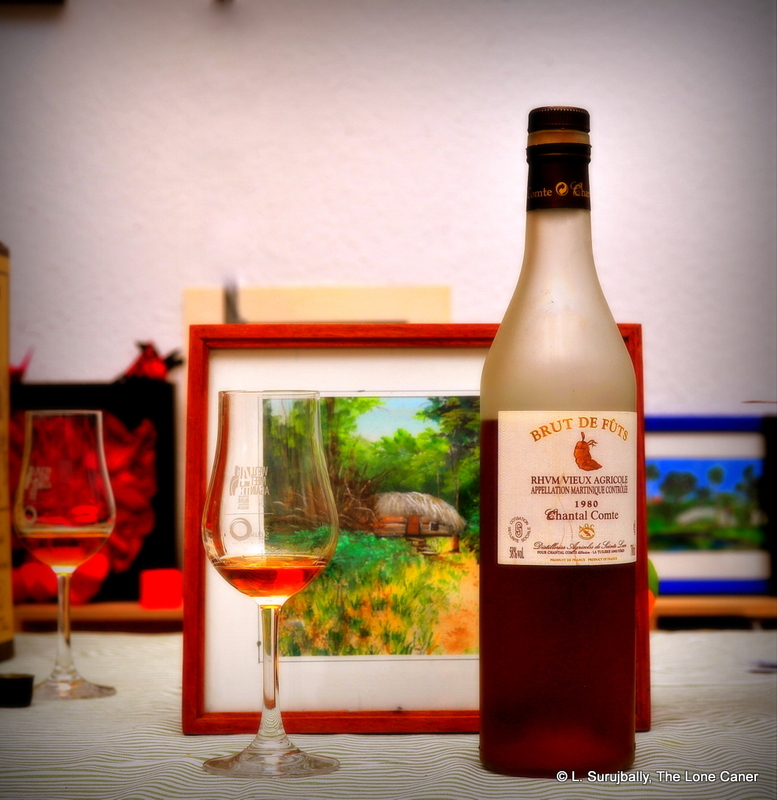 This rhum is one of the absolute best I’ve had all year, and it earns that accolade not because of stratospheric price or fancy bottle or rarity…but because it really is that extraordinarily good. 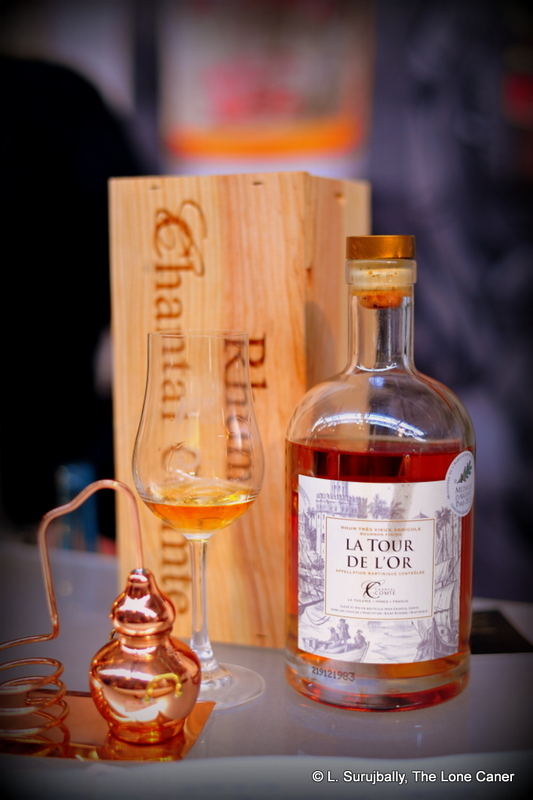 Chantal Comte’s website makes no mention of this rum at all. I contacted the company directly and they told me it was a seven year old, aged in oak (but not what kind). I highly recommend, if you ever try this rhum, to take your time with it. The scents and tastes simply grow richer over time. 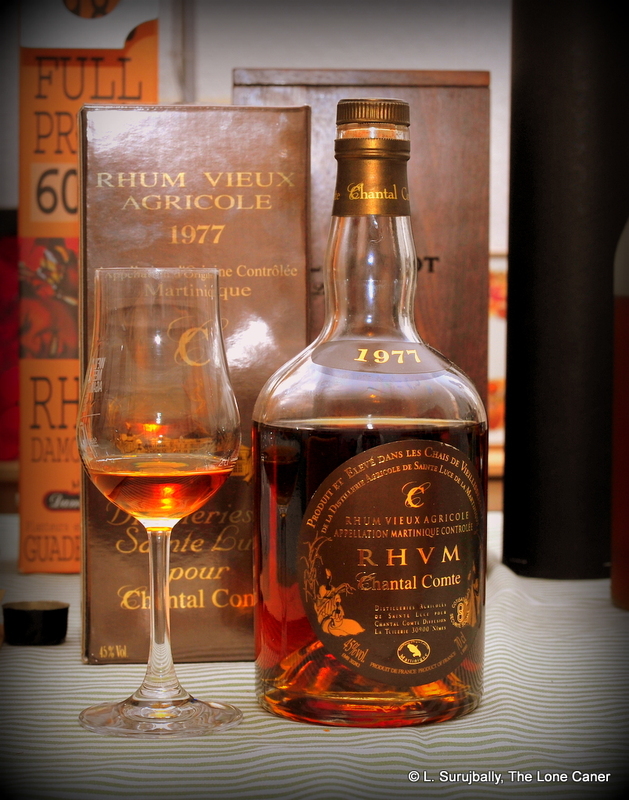 The closest rhum to this profile I recall is the Courcelles 1972 which exhibited many of the same characteristics, but was many years older. I read somewhere recently that “French Island style” (agricole) rhums represent less than 10% of market share for rums as a whole.The wonderment is, perhaps, that agricoles exist at all, given the preponderance of molasses based rums in the world. I think they remain an unappreciated resource, rums that live in their own space and time, in places we must be willing to visit, to touch, to sample, to experience. An inability to even concede they are worth trying is a profoundly depressing inadequacy, something like saying black and white, silent or subtitled films have no place in the world overrun by remakes, sequels and superhero retreads. Those who casually deny themselves such rhums are also denying themselves the building blocks of the drinking imagination.